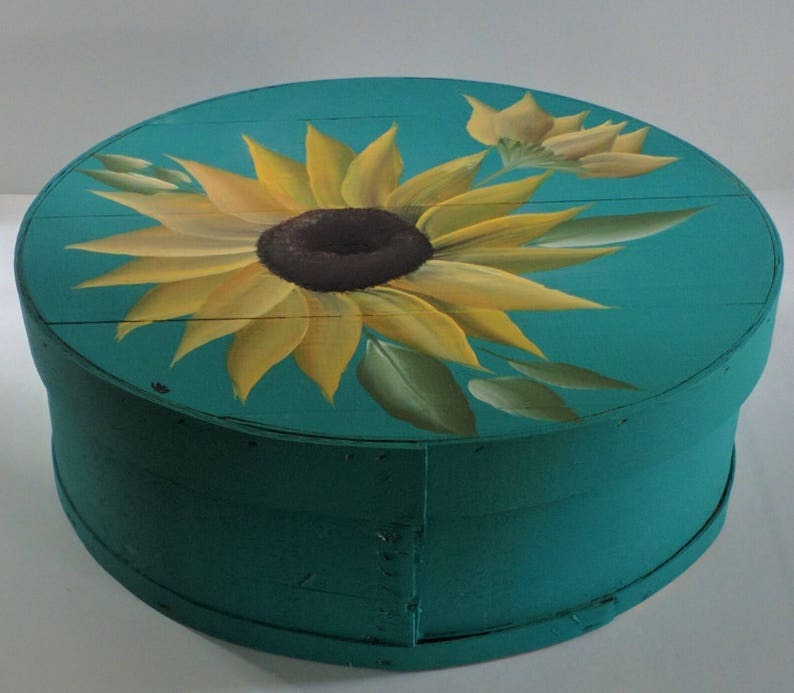 Sunflower - Re purposed cheese box. Hand painted design showcasing A Beautiful Sunflower and Sunflower Bud! Crafted with love and care in Virginia. I really love working with the cheese boxes. They are great to use as Gift Boxes For Christmas, Mothers Day, Fathers Day, Easter or Birthday Gifts, Storage Containers, Organization or a Decorative Piece! *As with all re-purposed materials some defects and rough pieces in the wood may exist. Box is not safe for direct food contact. CHEESE BOX CAN CONTAIN FOOD THAT IS WRAPPED IN A FOOD SAFE MATERIAL THAT KEEPS FOOD FROM DIRECT CONTACT WITH THE BOX. Box is not sealed, outdoor use is not recommended. Not recommended for children. Cheese Box Is NOT painted on the inside. Great pride is taken in packaging and shipping of my products. Thank you for taking the time to view my hand painted work of art! What a PERFECT way to begin awesome AUTUMN!! Once again, Goose and Gander has delighted (And surprised!) me with this wonderfully painted and multi-purpose wooden cheese box! It's even prettier than the picture...SO COLORFUL! Thank You...You are appreciated! Pumpkins For Sale - Hand Painted Re Purposed Wood Cheese Box. Uses: Gift Box, Storage, Organization, Decor, and focal point of a vignette.